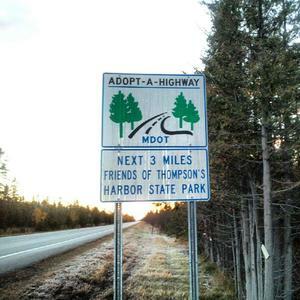 Established in 1988, Thompson’s Harbor State Park is a 5,110 acre rustic park named after the small bay situated in the center of its seven and a half miles of undeveloped Lake Huron shoreline. Primitive, marked hiking trails weave through the park’s varying terrain. Second growth forest with shorelines of limestone cobble beaches, and deep sand dunes await adventures. It is also home to Michigan’s state wildﬂower, the Dwarf Lake Iris, which is currently designated as a vulnerable threatened species by federal and state law. In 2013 we will celebrate the 25th anniversary of the park's founding, so please visit often for details. Click here for directions to the park.